Well, we finally get our book done this weekend. Introduction to Container Homes and Buildingsis finally done, at almost 100 pages! Whoo-hoo! Alex and I have been amazed at the response so far, so if you want to pick up a copy (a bargain at $9.95) then you’d better get on it! Now, this book isn’t the gigantioid “How-To” book we’re still currently working on. That book, when it’s done in a few months, will be a step-by-step guide to building an ISBU home. It will cover everything from selecting the best ISBU container, to pouring foundations, and putting on a roof. Everything you need to know in order to build an ISBU will be in that book. So, it’s going to be a tome. This smaller e-book is like Round 1 to the series. And at almost 100 pages, it’s a huge bargain. There is some fantastic information in here (especially about roofing options and insulation) that won’t be in the next book. And the houseplans are worth the $9.95 by themselves. If you’re interested in frugality and possibly building your own ISBU home one day, then you won’t want to miss this series. Again, I would not be working on this project if I didn’t believe in it 100%. Alex knows more about ISBU construction than anyone, and some of the tips he has in here you simply won’t find anywhere else. Want to give it a look? Head over to our site, www.containerhomebooks.com. Now that this is wrapped up, I’ll be back to regular posting this week! I never buy through paypal . Is there a way for me to send a check and Alex or whoever can send me a book through regular mail ? Please let me know , thanks, TM . I can’t even open Alex ‘s site . TM. @TM- No problem! Let me check with Alex first to make sure that’s ok, and I’ll get back with you as soon as I hear. Thanks so much! I’m establishing a company, the container houses. I need scientific information and technical experience on the subject. has This structure any technical books ? I am pleased you help me. 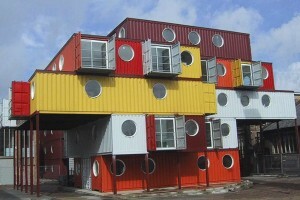 The container structure resist the earthquake, floods and fire! All you need are proper weldings and non-welded calculated joints. If i were you…i’ll start to thing about the insulating, and the icy winter! I wanted the 9.95 book. I want to order the 9.95 book as quoted un the first page. I, too, am interested in the $9.95 book. How do I order it? Hello, As a long time GC I have been using these metal crates for just about everything except their intended use. I never ran into any serious problems save for those that control the local building codes. We often used them as temporary living quarters on job sites etc all over the country. The common complaint or code question was “Do you have current approved structural evaluation to use those containers as safe living quarters?” Most of the time all that was desired was the $500 to $1500 building permit fee…I’ll bet that line of windfall revenue is still wide open in most municipalities ! On the book website at the bottom area it says $15.95, toward the top it says $11.95, and on this page it says, $9.95. This is our first monetary step toward setting up our own container home… so regardless of the price of this book, I’m sure it will be worth the price. I look forward to seeing your “tome” when it is finished. Alex Klien has taken a deposit of 6 thousand dollars from two female disabled United states veterans who have been working towards build this container affordable home. Now Mr. Klien will not answer any letters phone call, so the money sent as good faith is now gone. Have we been taken advantage of by this man who swears to take care of his fellow veteran. I have proof check was cashed and no containers are sitting on my property.